At the start of the 18th Century, the Scots were in trouble. A run of bad harvests was bad enough, but it was perhaps the ill- fated Darien scheme that really brought Scotland face to face with its inability to hack it on the world stage. They'd tried to play with the big boys; convinced them- selves they were worthy of a place in the sun ... but it wasn't ever really on. The country was up a gumtree and, individually, the cream of Scottish society had lost huge amounts in the Darien venture. Yes folks, this is how independence is bought and sold. Coming to a Mediterranean nation near you soon; and perhaps to all of us, if we don't tread carefully. Still, some say the Act of Union was the making of Scotland ... eh, Alex ? Crucially, of course, the Scottish government promised to underwrite the entire Darien venture. This ill-fated scheme cost some £400,000—a third of the entire wealth of Scotland at the time. The Scottish government simply couldn't afford to make good on its financial guarantees. A third of its entire wealth? Does that mean a third of one year's GDP or a third of everything? The banker who conceived the Darien scheme was William Paterson, a co-founder on the Bank of England. Seems those south of the border have been shafted too. Don't forget the work of Stephen Oppenheimer (http://en.wikipedia.org/wiki/Stephen_Oppenheimer) which shows that the population of most of England is genetically the same as Wales, Scotland and Ireland. There is probably less genetic difference between the Scots in general and the English in general than there is between the populations of Norfolk and Lancashire. Scotnat Salmond uses a typical debating trick: he does not try to prove Scotland is a separate country. He assumes it, and bases his arguments on the supposed "unfairness" which is predicated on this unspoken and unproved assumption. Arguing that Scotland should be a nation is a lot harder than simply assuming it is. This is all vastly different to the EU, which is an enforced amalgamation of nations with proven and widely recognised distinctiveness in culture, genetic makeup, ethnicity, and language. Hard to say Scotland isn't a nation. Could just as easily say Ireland isn't a nation as it hasn't been independent for nearly as long as Scotland was a kingdom. The Act of Union was not perhaps the making of Scotland, but it was certainly a marriage of some considerable convenience for both the English and the Scots. Almost immediately afterwards we became top nation and the rest, of course, is history. Scotland provided many of the "thinkers" who gave us the massive political and financial advantage we enjoyed. 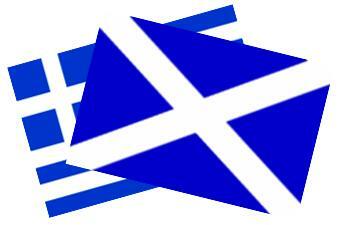 However, like Greece, Scotland is now mainly just a heavily indebted, slow growth holiday destination.